The 2018 Coretta Scott King campaign is brought to you by Victoria Gross, Black Portfolio Strategist, Office of Equity, Diversity, and Inclusion. It has been said that "A good leader takes a little more than his share of the blame, and a little less than his share of the credit." Dr. Martin Luther King Jr. is recognized by many as one of the greatest leaders in modern history, but, we want to acknowledge the leader who has taken a little less credit - Coretta Scott King. Women during the Civil Rights Era are often depicted as mere adornments to the movement. Besides notable trailblazers like Rosa Parks, most women who contribute to the fight for civil rights are often downplayed. Many are not acknowledged at all. Coretta Scott King's legacy goes beyond being the wife of Dr. King. As a student at Antioch College, Coretta was a budding activist during the peace movement. In the 1960s she even protested the Vietnam War before Dr. King. Some argue that she encouraged Dr. King to take a controversial stance against the war. Mrs. Scott King has gone on to receive over 60 honorary doctorates from various colleges and universities, authored three books, consulted leaders around the world while serving and founding organizations such as; the Center for Nonviolent Social Change, National Black Coalition for Voter Participation, and the Black Leadership Roundtable. It's time we change the narrative and remind the world that Mrs. Scott King was a fearless cultural influencer and societal shifter. Mrs. Scott King was born in Perry, Alabama to Obadiah and Bernice Scott--farmers who owned their own land. Despite the educational hardships caused by segregation, Coretta was the valedictorian of her 1945 graduating class as well as a talented singer and accomplished violinist. While attending the New England Conservatory of Music in Boston, Massachusetts on an award, she met future husband - doctoral candidate Martin Luther King Jr. They married summer of 1953 and moved to Alabama in 1954. Mrs. Scott King's gifted musical talents enabled her to produce and perform in a series of Freedom Concerts which combined poetry with musical selections. These concerts functioned as fundraisers for the Southern Christian Leadership Conference (SCLC) - where Dr. King served as the organizations first president. Gifted with the power of influence, Mrs. Scott King traveled the world speaking to leaders such as Kenneth Kaunda and Nelson Mandela, consulting on the behalf of racial and economic justice, the rights of women and children, Lesbian, Gay, Bisexual, Transgender (LGBT) dignity, equal employment, education, even environmental justice. In 1962 Coretta served as a Women's Strike for Peace delegate to the Nuclear Disarmament Conference in Geneva, Switzerland. Leading goodwill missions to several nations, she spoke at peace and justice rallies advocating for disarmament. After her husband's assassination 1968, Mrs. Scott King founded the Center for Nonviolent Social Change in Atlanta Georgia. In 1974 Mrs. King formed and co-chaired the National Committee for Full Employment and the Full Employment Action Council, a coalition of religious, business, civil and women's rights organizations dedicated to upholding a policy of full employment and equal economic opportunity. During the early 1980's, she was a regular commentator on CNN and a syndicated columnist for The New York Times (NYT), advocating for global human rights. For years she lobbied for federal government calling out U.S. Senators like Senator Jeff Sessions, for his gross injustices to civil rights. Her 1986 letter opposing Jeff Sessions is said to have derailed his judgeship nomination during the Reagan administration. Coretta's tenacity to push for social justice is a true testament to her character. Mrs. Scott King died in 2006, today she rests alongside her husband in The King Center's Freedom Hall complex in Atlanta, Georgia. More than a wife, a widow, and mother, Mrs. Scott King too, was an influential leader. We acknowledge her for all that she was and still is. Her legacy lives on. So, on this day, we do give credit to Dr. King for his wisdom. The wisdom to embrace the intelligence, fearlessness, resilience, and fortitude Coretta Scott King possessed. 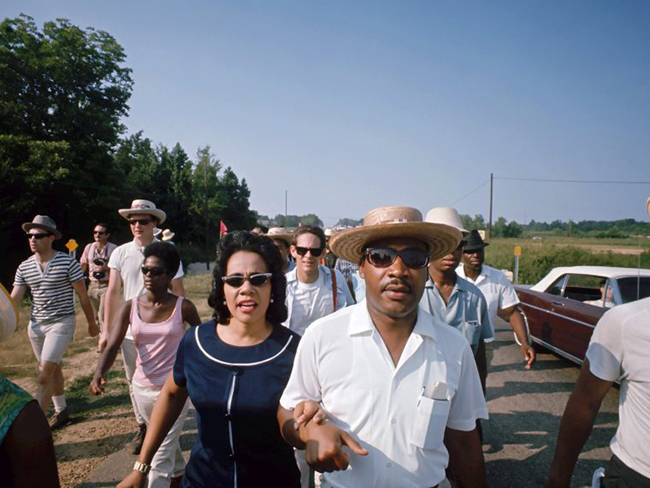 Thank you, Dr. King, for having the wisdom to ask for Coretta Scott for her hand in marriage and in the movement.